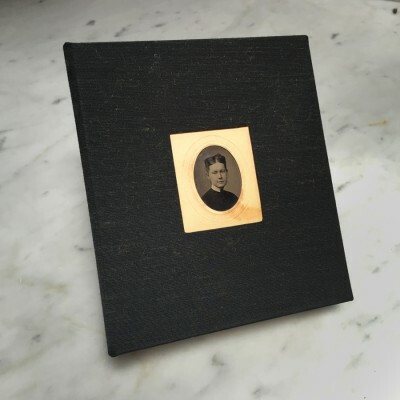 Many years ago I bought a handmade book with an antique tintype of a woman embedded into the cover. I intended to turn the book into a photo album of my pictures or maybe even my father’s. However, as I assessed the pictures in my archive and my fathers, I found none that I deemed worthy of this book with a beautiful cover. It remains blank to this day. The tintype on the cover beguiled me with the importance and meaning of a portrait. I did not know when I discovered this book, that I would one day be making tintypes myself. This dark art, the craft of collodion is like old-fashioned magic. There are potions and elixirs that stain your fingers and have a strong smell. There is a dark box with a cloth of mystery and enchantment. There is a feeling of anticipation and exhilaration as each plate emerges from the fixer. The sense of collaboration is palpable, as my subjects and I both wait for the image to clear, to see if we each held up our end and made a good picture.